Print postage directly from your desk. Unique sheet construction combines a half sheet label with a half sheet of paper. TrueBlock™ Technology completely covers everything underneath, so you can reuse boxes and envelopes over and over again. Easy to use and works with major internet postal service software. Print postage directly from your desk. Unique sheet construction combines a half sheet label with a half sheet of paper. 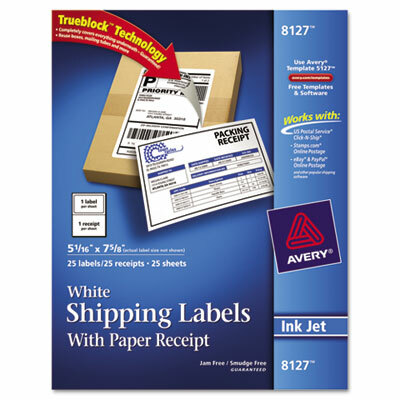 Takes only one pass through your printer to produce a paper receipt and shipping label. Features TrueBlock™ Technology to completely cover everything underneath, so you can reuse boxes and envelopes over and over again. Easy to use and works with major internet postal service software such as USPS® Click-n-Ship®, e-Bay®, PayPal® and Stamps.com®.